Get to know Jaidyn Stephenson Watch highlights of Jaidyn Stephenson, Collingwood's first draft selection from 2017, in action. Eastern Ranges midfielder/forward Jaidyn Stephenson will bring an x-factor to the Magpies' line-up. Image: AFL Photos. A graduate of NAB AFL Academy, Stephenson is a medium midfielder or forward with line-breaking speed, who is strong overhead and a long, accurate kick for goal. 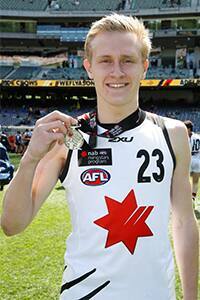 His 28 disposals and five-goal performance against South Australia in the NAB AFL U18 Championships was a highlight. He topped off an outstanding year with a best-on-ground performance in the All Star game at the MCG on Grand Final day, as well as showcasing his athletic potential at the Draft Combine. Successfully transitioned from a forward role into the midfield late in the TAC Cup season and enjoyed a strong patch of form for the Ranges. Stephenson and a few of his friends started their own men’s apparel brand – Class Above. His sister Tegan is a promising netballing talent, who has made the under-17 national squad. “Jaidyn is just a natural, instinctive player who is a match winner. He can go forward and kick goals, can play through the midfield or a wing and has been averaging 25 possessions. In one of the national championship games for Vic Metro, he had 25 touches and kicked five goals off a wing. He is ready to go as an AFL player despite still being pretty light. He has some serious x-factor and has things going for him that not a lot of players have. I’d expect he’ll be among the top 10.” – Darren Bewick (Eastern Rangers coach), Inside Football, November 2017.